I just recently adopted a Siamese cat (from what we can tell). He is 5 weeks old, a boy, and we named him Dobby, in honor of the elf in Harry Potter. Here is the story of how we got him. At two weeks old, Dobby and his litter mates were left on the side of the road in a box in the middle of November, so you can imagine how cold it was. 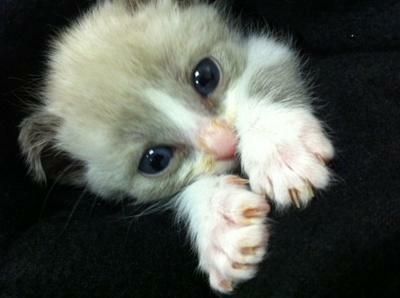 Well, someone found these precious babies and took them to an animal clinic. The same animal clinic in which a friend of mine volunteers for a school project. Since these pretty kittens were so little, they had to be fed every 4 hours, and my friend offered to take one home to feed him throughout the night. One night I decided to go over to hang out. Well, the second I laid my eyes on the soon to be Dobby I absolutely fell in love with him and HAD to have him. The next day, my sweet new baby kitten came home with me and has loved it here at our house every since. Little Dobby is now 5 1/2 weeks old. I've had him for almost three weeks now. He is SUCH a sweet kitten and is so much fun to love and play mommy with. I treat him like my own little son. He loves to talk and nibble on your fingers, and at night he will cuddle up to me and fall right asleep in my arms. He sleeps all throughout the night which is awesome. He is completely healthy. He is such a sociable kitten. He loves attention. We think he is a blue point Siamese longhair, because he looks identical to most pictures. He has HUGE baby blue eyes and gorgeous blue/grey hair. He also has almost all the characteristics that have been listed on this website. 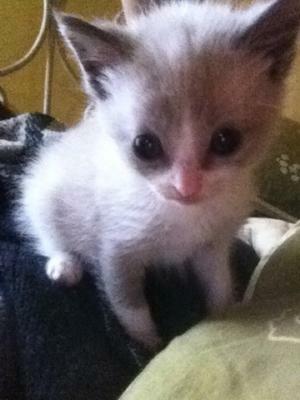 If he isn't a blue point Siamese longhair, I will be fine with it and love him all the same. I hope you like this story and enjoy the pictures I'll be posting. Hi Melissa. Thanks for sharing. Maybe the kitty's name should be Lucky. ;) I just don't understand how people can abandon these helpless creatures. Looks like you have a sweety. Aaah, Melissa! 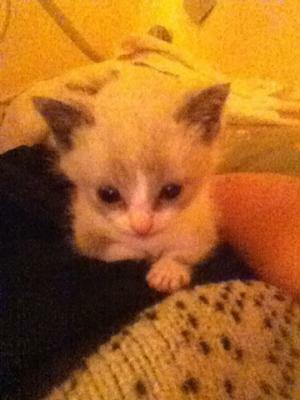 What a cute kitten, thank you so much for your story and photos. How anyone could abandon a boxful of such young kittens at any time, let alone in the winter, beats me. Dobby - that's a wonderful name ... and he looks just like a little elf at the moment! I do agree that he looks like a blue point, but I'm not sure he's Siamese, to me he looks more like a Mitted or Bicolor Ragdoll because of his white paws, and the white upside-down 'V' over his nose - or perhaps a Snowshoe cat (although they are a short-haired breed). Most kittens grow into their colors gradually over several months, so it may take a little longer to see exactly what he will look like as an adult. In truth, he's probably a little bit of several things, but he's certainly a cutie, as well as a very lucky little cat to have found a home with you.